When taking out a mortgage, buyers often consider how they will get a rate that will enable them to pay off their mortgage as quickly as possible. In other words, they want the lowest rate possible, as we all do. Many times it is often only those that are approaching retirement that actually start to think about how they will pay off their mortgage. 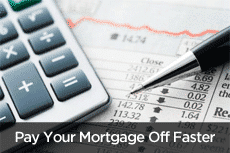 With careful planning, paying off your mortgage faster can be a realistic goal regardless of what your rate is. Pay your Mortgage More Than Once Per Month – Setting up a bi-weekly or weekly payment schedule can help you pay of your mortgage many times faster than by making a standard monthly payment. If you pay bi-weekly, you end up paying one or two extra mortgage payments per year which automatically reduces your amortization period. Increase Your payments When You Have More Money Coming In – Instead of using additional funds from a raise or bonus at work for something else, put it towards your mortgage every time you make a payment. Get a Reasonable Interest Rate – It goes without saying that it is important that you do your due diligence when shopping for a mortgage. While rate is only one of the factors to consider when choosing a mortgage professional, it is important that you choose your mortgage professional and rate carefully. Consider an Adjustable Rate Mortgage – While an adjustable rate mortgage may not offer the security of an unchanging mortgage payment, it can provide for a smaller rate and payment due than a fixed rate mortgage. This lower rate / payment will enable you to make larger payments towards the principal, which can help you pay off your mortgage significantly faster. Keep in mind that an adjustable rate mortgage may or not make the most sense for your needs, we can help you understand the options and which ones fit your needs the best. If you abide by some of the above strategies, it may be possible to pay off your mortgage up to a decade earlier. Not having to pay substantial housing costs later in life can help ease a major financial burden and can free up money for retirement, college education for the kids, investments or other financial needs.